The Mirror Room Lounge of the Hotel Bentley will open to the public at 4 p.m. Friday. Hotel owner Michael Jenkins said this is the first stage of the reopening of the 107-year-old hotel that has been closed for 11 years. The opening of the Mirror Room, initially planned for New Year’s Eve last December then expected for March, will miss by one day its most recent target of an April debut. Jenkins said he had all the permits needed to open the room last weekend, but decided he didn’t want such an occasion to diminish in any way a downtown celebration of Bolton’s 100th anniversary last weekend. “I didn’t want to have a conflict,” Jenkins said. “I thought it might be better if we waited till another time. We didn’t want to be the draw (on such a weekend). We want to be good neighbors. I want to be in this business a long time. I want to have friends and no enemies. Jenkins plans to employ “between seven to 10” people at the Mirror Room, noting 10 will work on opening night and maybe for a short time thereafter. Some of the staff are former employees at the Diamond Grill restaurant, another Jenkins property in downtown Alexandria. He said the room can hold approximately 175 people at a time. The original ceiling had mirrors, which were cracked and tarnished, and have been replaced by hand-painted black metal squares, and patrons will see the original stained glass windows and sconce wall lights, as well as special ordered hanging globe lights. 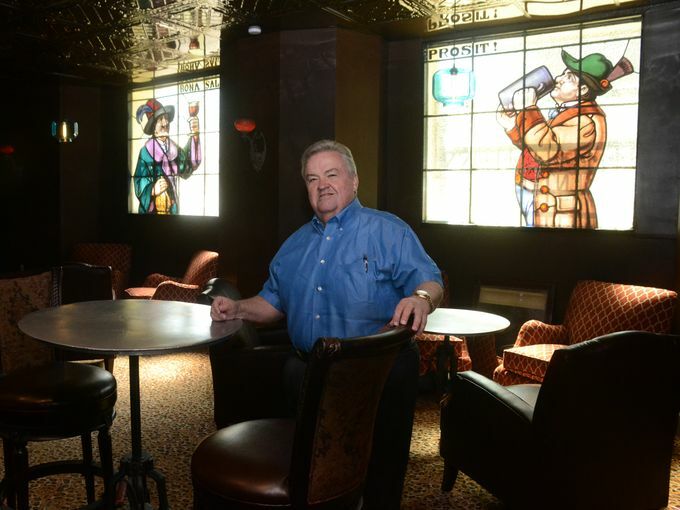 Jenkins said previous owner Bob Dean, who had removed the stained glass windows, agreed in the $3.4 million purchase deal in 2012 — when the building had been closed for almost eight years — to return the big, expensive windows, each showing a tavern patron from various European countries raising a toast. Dean also had the windows installed before the deal was closed, said Jenkins, who had the windows cleaned and polished. Gracing the opposite wall from the entrance are bookshelves filled with old law books. Jenkins offered to purchase the books from attorney John McLure, whose late father, T.C. McLure Jr., had owned the books but which were reportedly not used by the current McLure-Pickels law firm. “I just thought that added a nice touch to the place,” Jenkins said. “I appreciate (the donation) so much.